Figure 1. Anthracnose symptoms on black raspberry. Figure 2. Anthracnose symptoms on thornless blackberry cane. Anthracnose first appears in the spring on the young shoots as small, purplish, slightly raised or sunken spots. Later, they enlarge and become ash gray in the center with slightly raised purple margins. The spots are often so close together on black and purple raspberries that they form large irregular areas (cankers). The cankers may encircle the cane, sometimes causing the death of the cane beyond the canker. The bark in badly cankered areas often splits. Late season infections result in superficial gray, oval spots. The spots have definite margins, but are not sunken. They may become so numerous that the spots blend together, covering large portions of the cane. 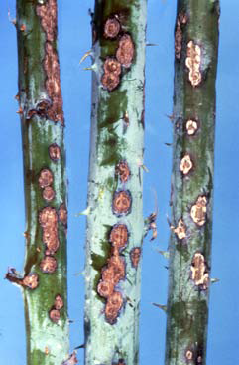 This is the characteristic “gray bark” symptom which is common on red raspberry. Dark colored specks (fungal fruiting bodies) develop in circles on the gray bark. Anthracnose sometimes attacks the leaves and can cause some leaf drop. Small spots, about 1/16 inch in diameter, with light gray centers and purple margins appear on the leaves. Lesion centers later fall out, leaving a shot hole effect. Anthracnose is caused by the fungus Elsinoe veneta. 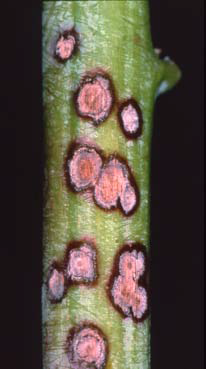 The fungus survives the winter in lesions on diseased canes. The following spring and summer, during wet and rainy periods, spores are released. Spores are carried by splashing rain to healthy first-year primocanes. These spores may then germinate and infect young tissues on developing primocanes. Disease development is favored by extended periods of wet weather. All steps possible should be taken to improve air circulation within a planting, to allow faster drying of foliage and canes. Reducing the number and duration of wet periods should reduce the potential for infection. Excessive applications of fertilizer (especially nitrogen) should be avoided, since it promotes excessive growth of very susceptible succulent plant tissue. Plants should be maintained in narrow rows and thinned to improve air circulation and allow better light penetration. Weeds are very effective in reducing air movement; therefore, good weed control within and between rows is important for improving air circulation within the planting. After harvest, remove and destroy all old fruited canes (floricanes) and any new primocanes that are infected. It is best to remove old canes during the dormant season (winter or early spring) before new growth starts in the spring. Remember, the fungus overwinters on old-infected canes. Remove all wild brambles growing in the area because they can serve as a reservoir for the disease. Where the disease is established in the planting, fungicide applications are generally required to achieve adequate control. For the most current spray recommendations, commercial growers are referred to Bulletin 506, Midwest Fruit Pest Management Guide, and backyard growers are referred to Bulletin 780, Controlling Diseases and Insects in Home Fruit Plantings. These publications can be obtained from your county Extension office or the CFAES Publications online bookstore at estore.osu-extension.org. Figure 3. 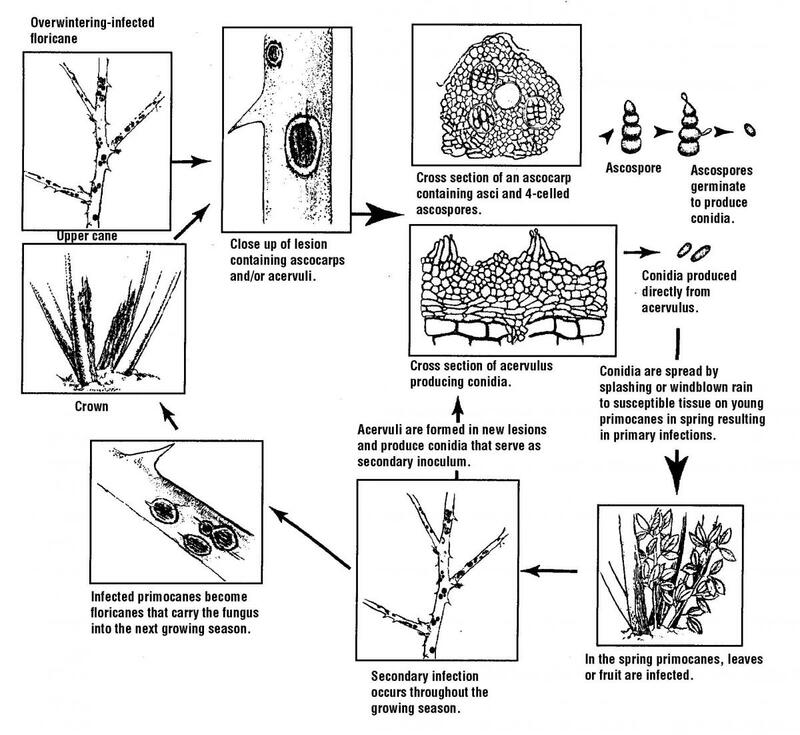 Disease cycle of anthracnose.